"We, the undersigned, hereby certify and witness with our signatures that whereas we have been chosen as judges to decide the controversy which has taken place at Wilna between R. Isaac b. Jacob and R. Jonah b. Isaac, in the matter of the taxation of Polotzk. and whereas the disputant parties appeared before us, and the aforesaid R. Jonah has given to the aforesaid R. Isaac security in behalf of R. Abraham b. Jacob and his brother R. Menahem. . . . In none of the rabbinical writings is mention made of these rabbis; but the litigants, R. Jonah b. Isaac, R. Abraham b. Jacob and his brother Menahem (or Mendel), are mentioned in the official records, and are cited by Bershadski ("Russko-Yevreiski Arkhiv," No. 69) as the tax-farmers for certain localities, appointed by the Polish king in 1556. In the responsa of Joel ha-Levi Sirkes (BaḤ), second collection (Koretz 1785), the closing paragraph of section 75 has the following: "The above is the testimony given before us by Jacob b. R. Menahem Kaẓ. Signed in the city of Wilna, on the fourth day of the week, twenty-third day of Tammuz, in the year 5323 . Jonathan b. R. Samuel, Eliezer b. R. Joel, Menahem b. R. Samuel Margolis." In the exchange of correspondence on legal questions of Ma-HaRaM of Lublin (Metz, 1769), the closing paragraph of section 7 reads: "By this means the murderer was caught as set forth in full in the testimony taken at the city of Wilna, on the third day of the week, on the twentieth of Tammuz, in the year 5553 . " The fact, therefore, that the Jewish community of Wilna was represented by several rabbis, and not by one, as small communities are, is conclusive proof that the community was at that time considerable. There is evidence also that Jews resided in Wilna in still earlier periods. It is known that in 1490 the plenipotentiary of the Grand Duke of Moscow, in a letter to King Casimir, complained of the excessive tax imposed upon merchants traveling to and from Moscow through Wilna by the Jewish lessee of taxes Michael Danilow ("Regesty i Nadpisi," i., No. 208, St. Petersburg, 1899). In 1495 the grand duke presented to the city of Wilna some property which formerly had been owned by a Jew named Janischevsky (ib. No. 215). In 1507 King Sigismund wrote that he had bought various goods from the Jewish merchant Michael Rebinkowitz (Yesofovich; ib. No. 231). Under the date of 1508 there are statements of accounts of Jewish lessees of taxes in Wilna and Brest-Litovsk (ib. No. 234). In 1532 the Jew Joshua Paskowitz was appointed by King Sigismund as chief collector of taxes on wax in the market of Wilna (Bershadski, "Russko-Yevreiski Arkhiv," No. 140). In 1550 a certain Jewess, Fanna Kasparova, who resided at Wilna, refused to surrender to the Jewish court the Jew Chatzka Issakowitz, defying the Jewish court messenger sent to take him, although she had previously given bond for the appearance of the said Issakowitz (ib. No. 167). In 1555 King Sigismund granted to a certain Jew of Wilna a lease for three years of the privilege of stamping coins (ib. No. 45). The lessees, in 1560, of the privilege of stamping coins in Wilna were the Jews Felix and Borodavka (ib. No. 125). In Sept., 1562, a Gentile brought before a magistrate a charge of assault against a Jew by the name of Israel, the defendant being described in the complaint as a physician (ib. No. 167). In 1568 King Sigismund issued an order commanding the Jewish community of Wilna to pay the taxes due to the treasury ("Regesty i Nadpisi," No. 557). In 1583 the Jew Judah Salamonowitz of Wilna paid taxes on goods brought by him from Lublin to Wilna, consisting of a truckload of wine, licorice, and linen ("Archeographicheski Sbornik," part iii., p. 289). The name of the Jew Moses Tomchamowitz of Wilna, secretary of the mint, is mentioned in the records of 1587 ("Regesty i Nadpisi," No. 660). 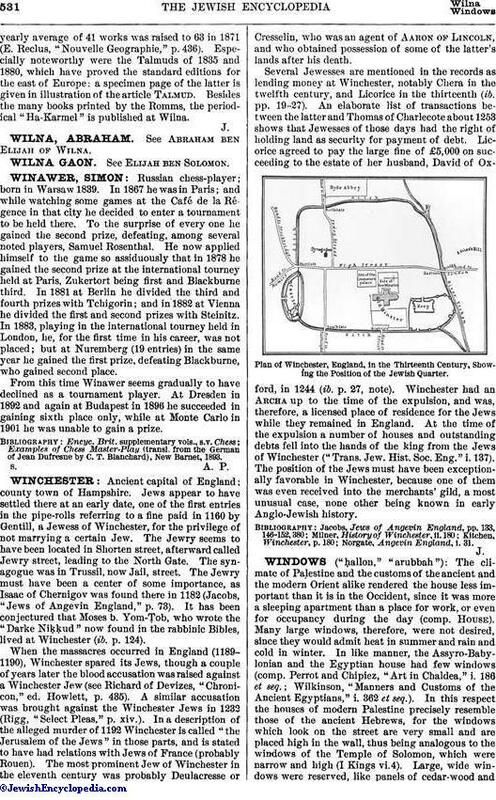 In 1592 the citizens of Wilna attacked and destroyed the bet ha-midrash of Wilna ("Records of the Community of Wilna," part xxviii., p. 52, Wilna, 1901). In 1593 King Sigismund III. 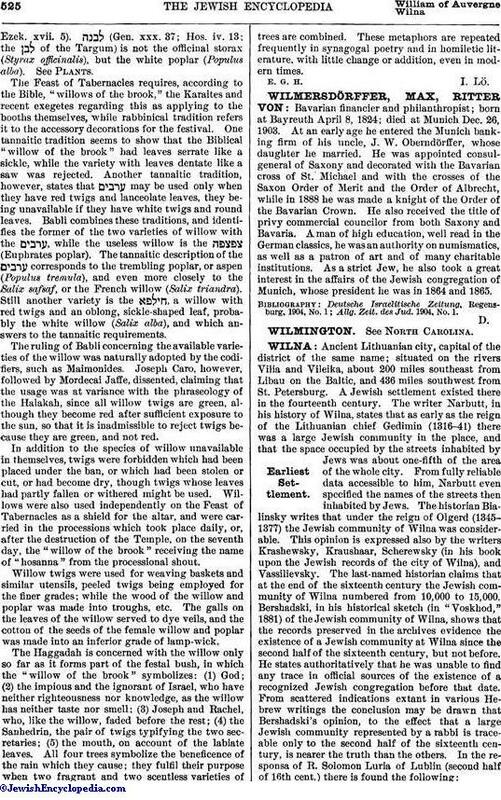 granted to the Jews of Wilna the privilege of buying real estate from the noblemen of that city; at the same time he made many other concessions to them, including permission to rebuild the bet ha-midrash (Bershadski, in "Voskhod," 1887). From the above data it is evident that there was a large Jewish community in Wilna in the middle of the sixteenth century, but that until then it was insignificant. 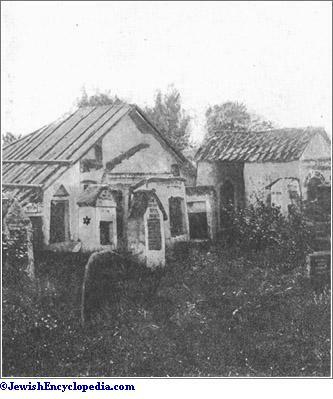 The Jews' street in Wilna, the one formerly called by the name of St. Nicholas, which terminates at the Hospital of St. Mary, was known as the "Jews' street" in 1592 (Bershadski, "Istoria Yevreiskoi Obshchiny v Wilnye," in "Voskhod," 1887, p. 84), and is still so called. In the seventeenth century the Jews in Wilna and in Lithuania generally enjoyed peace and prosperity. At the beginning of their settlement in that country their relations with the non-Jewish population were very friendly. Even from the orders given by Bogdan Chmielnicki to the Polish and Lithuanian magnates it is evident that up to that time the Lithuanian Jews lived in happiness and peace, and that only the Cossacks subjected them to oppression and maltreatment. But from that time on they gradually sank into misfortune. The conclusion to be drawn, therefore, from the study of the history of the Jews of Wilna during that period is that the kings and rulers of Poland and Lithuania were considerate toward them, but that the non-Jewish population was extremely hostile. In 1636 King Ladislaus IV. 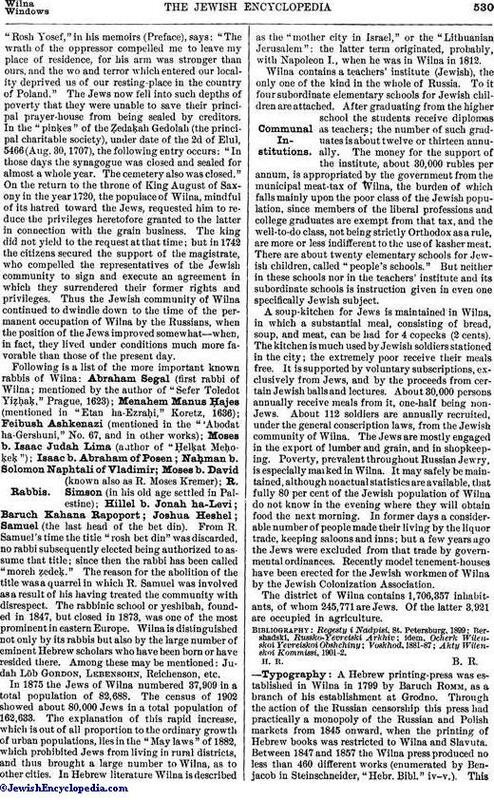 granted certain important concessions to the Jews of Wilna. In 1669 King Michael confirmed six privileges previously enjoyed by them. King John III., in 1682, permitted them to conduct their own census-taking. Five years later (1687) the same king wrote to the commander of his army and to the governor of Wilna warning them to see that the Jews of Wilna were not molested by the non-Jewish population, and telling them that they would be held personally responsible and punished severely for any violation of this order. 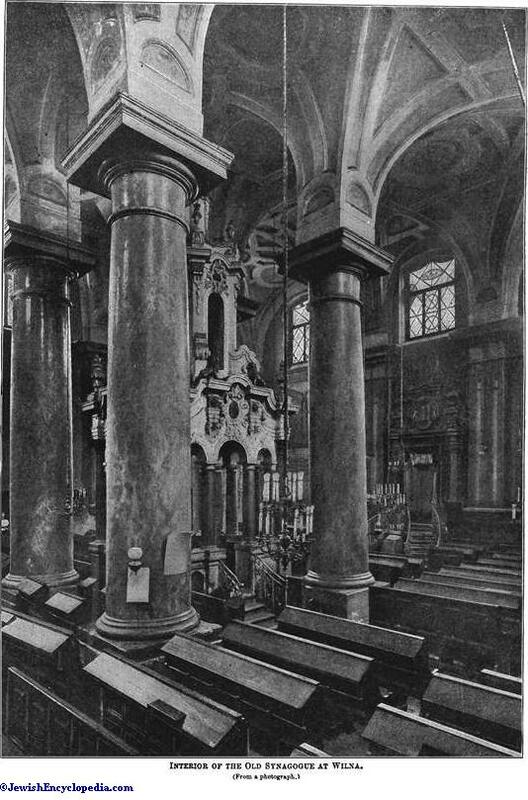 Interior of the Old Synagogue at Wilna. From the seventeenth century on the Wilna Jews passed from tragedy to tragedy, the differences being only in degree and extent, as may be seen from the series of restrictions and limitations imposed upon them, leading at times to riots and consequent destruction of property. In 1635 the populace, in a mood of frenzy, destroyed the newly erected and elaborately appointed Jewish prayer-house at Wilna, tearing to pieces eighteen scrolls of the Law, appropriating their golden handles and everything else of value, and not leaving a stone of the prayer-house unturned (Bershadski, in "Voskhod," May, 1887). In 1653 King John Casimir was induced to issue a circular prohibiting the Jews from engaging in certain businesses and from accepting employment as servants in the houses of Gentiles ("Regesty i Nadpisi," No. 940). In 1663 the trade-union of Wilna passed an ordinance prohibiting Jewish glaziers from entering that union, and forbidding glaziers to receive Jewish apprentices or to employ Jews in any other capacity (ib. No. 1019). In 1664 the fishermen's union of Wilna excluded the Jews from the fishing trade (ib.). In the same year the king yielded to the request of the citizens of Wilna and prohibited the Jews from engaging in the occupations of silversmiths and goldsmiths (ib. No. 1022). It seems also that two years later (1666) the Jews were excluded from the grain business (ib. No. 1041), in 1667 from tanning (ib. No. 1056), and in 1669 from the bristle manufacturing business (ib. No. 1078). But as long as Wilna remained under Polish and Lithuanian rulers all those restrictions and limitations were tolerable; the real and acute suffering began with the conquest of Wilna by the Russians in 1654, when the savage hordes of Cossacks, led by their barbaric chieftain Chmielnicki, destroyed everything destructible in the city, and killed every Jew they met (see "Entziklopedicheski Slovar," vol. vi., p. 384). The Jews that remained were banished from Wilna by order of the Russian king Alexis Mikhailovich ("Regesty," No. 971). To this wholesale expulsion from Wilna reference is made in the preface of "Be'er ha-Golah" by R. Moses Ribkes: "And on the fourth day of the week, on the 23d of Tammuz, in 5415 , the whole congregation fled for its life from the city of Wilna, as one man. Those who had provided themselves with conveyances carried their wives, children, and their small belongings in them; but those who had no conveyances traveled on foot and carried their children on their backs." Further reference to that catastrophe is made in the "Bet Hillel" on Yoreh De'ah (section 21), and in the responsa collection "Ẓemaḥ Ẓedeḳ" (No. 101). Among the exiles from Wilna in that year were the following prominent rabbis: Aaron Samuel b. Israel Kaidanover (who afterward became rabbi of Cracow, and who used to supplement his signature with the words, "the exile from the city of Wilna"; see the preface to his "Birkat ha-Zebaḥ"); Shabbethai b. Meïr ha-Kohen (author of "Megillah 'Afah," in which the Wilna catastrophe of that year is described); and Ephraim b. Aaron (author of "Sha'ar Efrayim"). Wilna remained in the hands of the Russians for about six years, when it again came under the rule of the kings of Poland; the lot of the Jews, however, remained as bad as ever. The vernacular of the Jews of Wilna at that time seems to have been Russian. This conclusion is drawn from the following statement in the volume of responsa "Geburot Anashim" (p. 26): "It happened in the city of Wilna that a man, at the wedding ceremonies, used the Russian language in betrothing his bride, 'Ya tebja estum meḳaddesh.'" The date following this is Dec. 26, 1636. Part of the Old Cemetery at Wilna. Star Shows Tombstone of Elijah Gaon. (From a photograph. )The Eighteenth Century. Page from Shulḥan 'Aruk, Printed at Wilna, 1880. Nothing important of a favorable nature happened to the Jewish community of Wilna during the eighteenth century. In 1708, when Wilna was taken by Charles XII. of Sweden, more than 20,000 died there from famine and pestilence in a comparatively short time; a great number of Jews being among these, the community became poverty-stricken, and many were compelled to leave the city ("Entziklopedicheski Slovar"). The author of the "Rosh Yosef," in his memoirs (Preface), says: "The wrath of the oppressor compelled me to leave my place of residence, for his arm was stronger than ours, and the wo and terror which entered our locality deprived us of our resting-place in the country of Poland." The Jews now fell into such depths of poverty that they were unable to save their principal prayer-house from being sealed by creditors. In the "pinḳes" of the Ẓedaḳah Gedolah (the principal charitable society), under date of the 2d of Elul, 5466 (Aug. 30, 1707), the following entry occurs: "In those days the synagogue was closed and sealed for almost a whole year. The cemetery also was closed." On the return to the throne of King August of Saxony in the year 1720, the populace of Wilna, mindful of its hatred toward the Jews, requested him to reduce the privileges heretofore granted to the latter in connection with the grain business. The king did not yield to the request at that time; but in 1742 the citizens secured the support of the magistrate, who compelled the representatives of the Jewish community to sign and execute an agreement in which they surrendered their former rights and privileges. Thus the Jewish community of Wilna continued to dwindle down to the time of the permanent occupation of Wilna by the Russians, when the position of the Jews improved somewhat—when, in fact, they lived under conditions much more favorable than those of the present day. Following is a list of the more important known rabbis of Wilna: Abraham Segal (first rabbi of Wilna; mentioned by the author of "Sefer Toledot Yiẓḥaḳ," Prague, 1623); Menahem Manus Ḥajes (mentioned in "Etan ha-Ezraḥi," Koretz, 1636); Feibush Ashkenazi (mentioned in the "'Abodat ha-Gershuni," No. 67, and in other works); Moses b. Isaac Judah Lima (author of "Ḥelḳat Meḥoḳeḳ"); Isaac b. Abraham of Posen; Naḥman b. Solomon Naphtali of Vladimir; Moses b. David (known also as R. Moses Kremer); R. Simson (in his old age settled in Palestine); Hillel b. Jonah ha-Levi; Baruch Kahana Rapoport; Joshua Heshel; Samuel (the last head of the bet din). From R. Samuel's time the title "rosh bet din" was discarded, no rabbi subsequently elected being authorized to assume that title; since then the rabbi has been called "moreh ẓedeḳ." The reason for the abolition of the title was a quarrel in which R. Samuel was involved as a result of his having treated the community with disrespect. 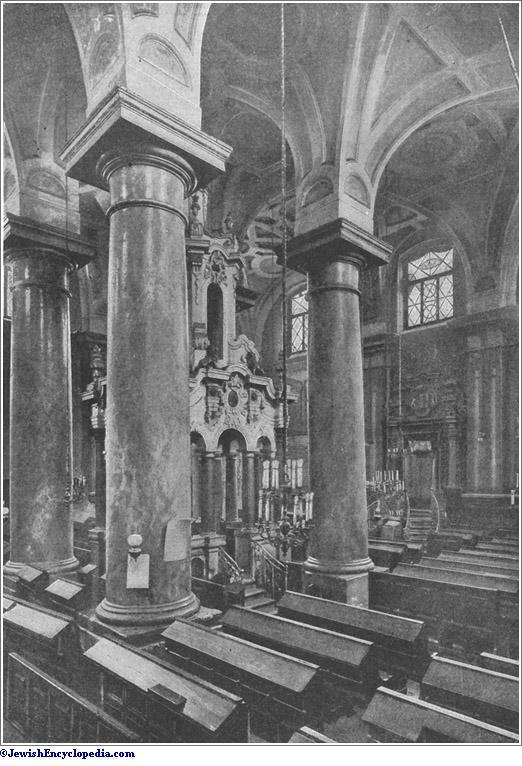 The rabbinic school or yeshibah, founded in 1847, but closed in 1873, was one of the most prominent in eastern Europe. Wilna is distinguished not only by its rabbis but also by the large number of eminent Hebrew scholars who have been born or have resided there. Among these may be mentioned: Judah Löb Gordon, Lebensohn, Reichenson, etc. 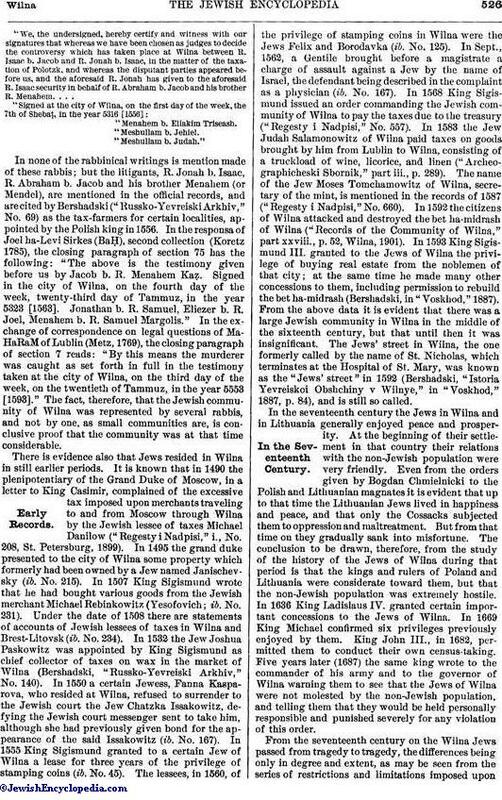 In 1875 the Jews of Wilna numbered 37,909 in a total population of 82,688. The census of 1902 showed about 80,000 Jews in a total population of 162,633. The explanation of this rapid increase, which is out of all proportion to the ordinary growth of urban populations, lies in the "May laws" of 1882, which prohibited Jews from living in rural districts, and thus brought a large number to Wilna, as to other cities. In Hebrew literature Wilna is described as the "mother city in Israel," or the "Lithuanian Jerusalem": the latter term originated, probably, with Napoleon I., when he was in Wilna in 1812. Wilna contains a teachers' institute (Jewish), the only one of the kind in the whole of Russia. To it four subordinate elementary schools for Jewish children are attached. After graduating from the higher school the students receive diplomas as teachers; the number of such graduates is about twelve or thirteen annually. The money for the support of the institute, about 30,000 rubles per annum, is appropriated by the government from the municipal meat-tax of Wilna, the burden of which falls mainly upon the poor class of the Jewish population, since members of the liberal professions and college graduates are exempt from that tax, and the well-to-do class, not being strictly Orthodox as a rule, are more or less indifferent to the use of kasher meat. There are about twenty elementary schools for Jewish children, called "people's schools." But neither in these schools nor in the teachers' institute and its subordinate schools is instruction given in even one specifically Jewish subject. A soup-kitchen for Jews is maintained in Wilna, in which a substantial meal, consisting of bread, soup, and meat, can be had for 4 copecks (2 cents). The kitchen is much used by Jewish soldiers stationed in the city; the extremely poor receive their meals free. It is supported by voluntary subscriptions, exclusively from Jews, and by the proceeds from certain Jewish balls and lectures. About 30,000 persons annually receive meals from it, one-half being non-Jews. About 112 soldiers are annually recruited, under the general conscription laws, from the Jewish community of Wilna. The Jews are mostly engaged in the export of lumber and grain, and in shopkeeping. Poverty, prevalent throughout Russian Jewry, is especially marked in Wilna. It may safely be maintained, although no actual statistics are available, that fully 80 per cent of the Jewish population of Wilna do not know in the evening where they will obtain food the next morning. In former days a considerable number of people made their living by the liquor trade, keeping saloons and inns; but a few years ago the Jews were excluded from that trade by governmental ordinances. Recently model tenement-houses have been erected for the Jewish workmen of Wilna by the Jewish Colonization Association. The district of Wilna contains 1,706,357 inhabitants, of whom 245,771 are Jews. Of the latter 3,921 are occupied in agriculture. 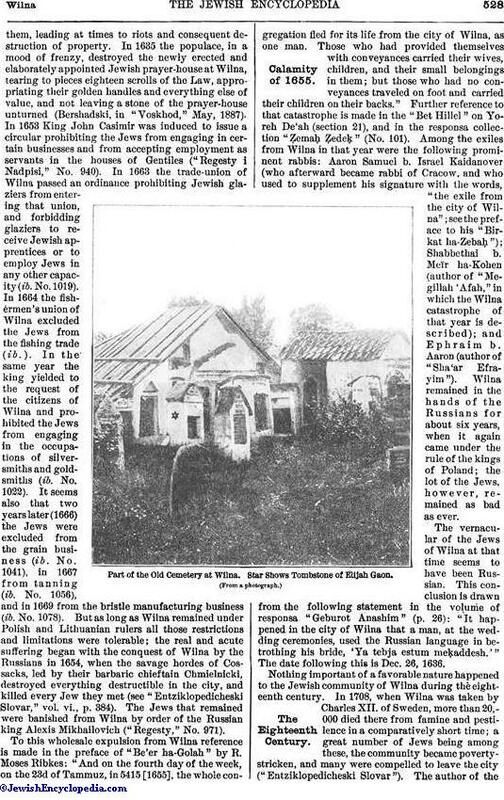 A Hebrew printing-press was established in Wilna in 1799 by Baruch Romm, as a branch of his establishment at Grodno. 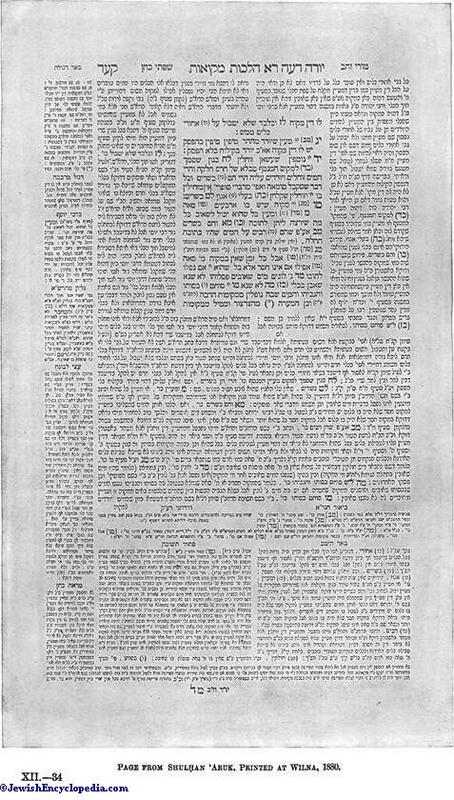 Through the action of the Russian censorship this press had practically a monopoly of the Russian and Polish markets from 1845 onward, when the printing of Hebrew books was restricted to Wilna and Slavuta. Between 1847 and 1857 the Wilna press produced no less than 460 different works (enumerated by Benjacob in Steinschneider, "Hebr. Bibl." iv-v.). Thisyearly average of 41 works was raised to 63 in 1871 (E. Reclus, "Nouvelle Geographie," p. 436). 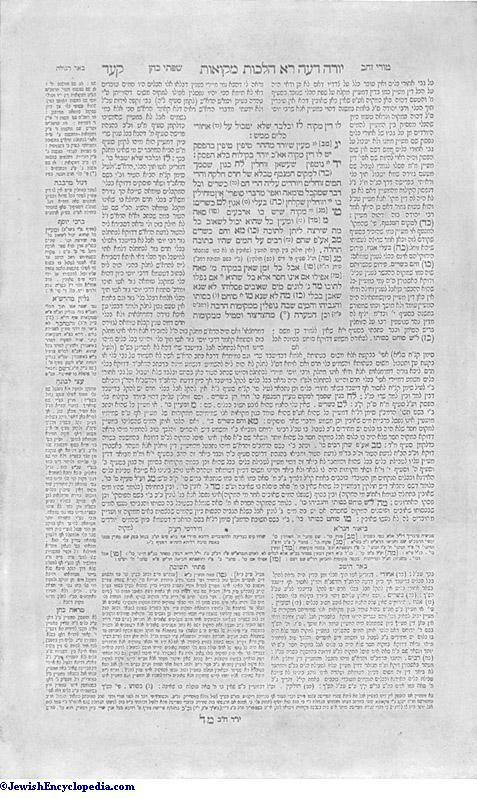 Especially noteworthy were the Talmuds of 1835 and 1880, which have proved the standard editions for the east of Europe: a specimen page of the latter is given in illustration of the article Talmud. Besides the many books printed by the Romms, the periodical "Ha-Karmel" is published at Wilna.